Richa Anirudh is a journalist. She currently hosts a breakfast show on 92.7 BIG FM called Dilli Meri Jaan which deals with social and civic issues of Delhi. 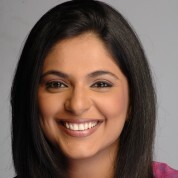 Richa also anchors prime time bulletins on News Channel IBN7. She is the Editor in chief of School Magazine – School Live which has created a platform for students of all schools to read write and share views with each other. From 2007 to 2013, Richa hosted the very popular and award winning talk show “Zindagi Live” on IBN7. The show won the Best talk show ‘indiantelevision.com’ award in all its 6 seasons, once won the best talk show award by Indian television academy and twice won the Laadli media award for Gender sensitivity. Richa has been awarded the Most Promising Young female journalist award by the Amity University. Richa Aniruddha was selected for the prestigious Chevening Gurukul Scholarhip by the UK government in 2012. She has appeared in 3 seasons of the TV game show- Kaun Banega Crorepati as the Expert Advisor. "I am very passionate about education, about the right kind of teaching methodologies and also about the intent involved in imparting education. In India, I have seen teachers teaching under flyovers, in slums- free of cost and selflessly. I have always been very appreciative of teachers and whenever I got a chance through my talk show, I have saluted the teachers who have changed the lives of hundreds of children. This award gives me a chance to appreciate and acknowledge the work done by teachers globally. "